Birdwatchers are familiar with Common Sandpipers turning up on spring passage at locations where they do not breed. Many of these are potentially suitable breeding sites thus meriting an ‘H’ status code and mapping in this Atlas as ‘possible’ breeding. Most move on rapidly, usually within a day, but some favoured sites attract two or more birds and have been recorded as ‘P’, probable breeding. In practice, true breeding behaviour is very noticeable. Adults are very demonstrative whilst they are establishing territories and attracting a mate, although they go quiet for three weeks whilst the female incubates the four eggs. After hatching in early June, their vocal defence of their chicks makes it easy to confirm breeding, and the fact that only one tetrad furnished proof in this Atlas suggests that the county breeding population is very low: in the First Atlas, breeding was confirmed in 14 tetrads. Females often leave their mates when the chicks are half-grown, and males quit the breeding areas almost as soon as the young can fly. Common Sandpipers are recorded widely on return passage, with failed breeders and females from June onwards, and males and independent young birds in July. A few enthusiastic observers also included such birds as ‘H’ in their Atlas submissions, and they are mixed with others on the map. It is clear that the map gives an inflated impression of the species’ now-tenuous toehold on Cheshire. This is an easy species in which to demonstrate at least probable breeding, and birds only ‘present in suitable nesting habitat’ are likely to have been on passage (Dougall et al 2004). This also applies to some of the ‘P’ records: disregarding ‘H’ and ‘P’ records, observers in only three tetrads found evidence of breeding: a pair with chicks in 2004 at Acre Nook SQ (SJ87F), a pair displaying in 2005 alongside the River Dee in SJ45C, and two pairs at Lamaload Reservoir (SJ97S) in 2005 ‘defending territory with much calling’. 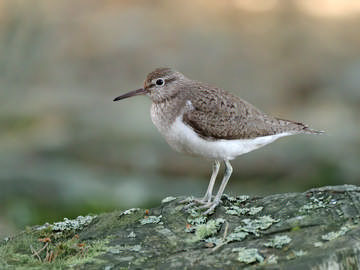 Common Sandpiper is normally regarded as one of the characteristic breeding birds of upland hill streams, but none was found in such habitat during this survey; in fact all but three of the habitat codes recorded – in SJ45 and SJ47 – were standing water, especially sand quarries and the upland lakes or reservoirs. Nationally, the BTO’s Waterways Bird Survey, albeit based on small samples, shows a population decline of 37% from 1984 to 2004. Derek Yalden, writing in our First Atlas, noted that recruitment barely balanced adult mortality in his Peak District study area, and birds there were badly hit by an April snowstorm in 1989, from which they did not recover to their former levels; this could have been caused by poorer breeding success or reduced survival of first-year birds over winter in West Africa (Holland & Yalden 2002). However, surveys of the South Pennines Moors SPA showed that the breeding population of Common Sandpipers more than doubled between 1990 and 2004-05, so the drop in Cheshire is likely to have been caused by some local factors (Eaton et al 2007). It is not clear when the Cheshire decline started as the records submitted annually to CAWOS depend on the vagaries of recording effort. Immediately after the end of concerted effort for the First Atlas, when the national population was probably at its peak, the county bird report for 1985 noted that records were submitted from only four sites with no proven breeding, and commented that ‘if this reflects the true situation, then the species is in danger of becoming extinct as a breeding bird in the county’. The call for ‘more relevant records’ was not heeded immediately but during 1988-1992 from 9 to 15 pairs were confirmed or probably breeding, at Acre Nook and Arclid SQs and the reservoirs in the eastern hills. The recorded population then dropped and from 1995 onwards (apart from 2001 when there could have been up to 9 pairs present) the maximum in any year has been four pairs.